Your vacation to California's Lake Tahoe will provide plenty of places to go and things to see. By choosing a vacation home by owner you will be able to enjoy the heart and soul of Lake Tahoe without having to invest a great deal of money into your vacation. This is an essential element in an enjoyable vacation, especially for those who are traveling with children. Lake Tahoe offers plenty of activities for everyone to see and do and with the money you will save on lodging, you can truly enjoy your vacation. Regardless of what you enjoy doing on your vacation, you will find activities of interest. Even those who prefer to relax rather than engage in any energy-burning activities will find pleasure in Lake Tahoe. If you enjoy hiking, you'll love visiting the Marlette Lake Trail where you can hike to Marlette Lake from Spooner Lake in Nevada State Park. There are some exquisite views of Tahoe along this 4-mile hiking expedition where you will also have access to the Flume Trail. As the close of winter causes the snowfall to fill the rivers with raging rapids, there is no better time to raft along 8 of Tahoe's best rivers all within only 3 hours of the area. A fair new event that just started two years ago is the annual "Sample the Sierra" in South Lake Tahoe. The festival consists of approximately 30 vendors that include restaurants in South Lake Tahoe to wineries and growers in El Dorado County. You will also find live music, art activities and a marketplace and artwork on display from local artists. The annual Tahoe Autumn Food and Wine Festival is still in operation after more than two decades and is considered a premier gourmet event. The South Shore of Lake Tahoe includes plenty of entertainment including several casinos and beaches. 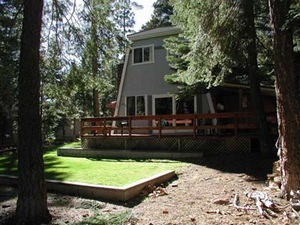 Before you make any further plans be sure to book your vacation home by owner for your Lake Tahoe trip. The cost savings alone will allow you to invest more time and money into enjoying your vacation instead of struggling to save money before your vacation or watching what you spend while you are on vacation. A vacation home by owner in Lake Tahoe will allow you to spend more time enjoying your vacation and less time worrying about the cost. Check out nearby Carnelian Bay , Donner Lake , Kings Beach , Lake Tahoe , South Lake Tahoe , Squaw Valley , Tahoma , Truckee , Twin Bridges .